"A rose - sweet, romantic - it's delicate layers curve naturally, uniquely, and beautifully like a lover's embrace." Bridal gowns are our passion. From style to construction, we believe that what you wear on your wedding day sets the tone for everything else. 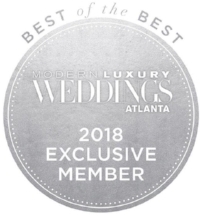 At Curvy Rose we specialize in finding unique, quality wedding gowns that tell the story of your love. Here you are empowered to be who you are - to speak your heart and be listened to. No pushy stylists or nosey brides in a gallery of mirrors waiting to see which wedding gown you'll choose next. Every private appointment is about you - the bride - and we prefer it that way. Curvy Rose is a reflection of our love of fashion and romance. Inspired by our grandmother Rosa Beatrice, a seamstress whom we affectionately called, Rosie Bea, we strive to be the heartbeat of her love. From the pink tones of our shop to the lovely touches we incorporate into every appointment, we extend her love to you, to be uniquely yourself, to #ChooseLove and #BeaU. We invite you to a personalized bridal experience that embraces your love and inspires your soul. Mother, sister, friend, and wordsmith, Kanika has always been attracted to vintage lace and whimsical accessories. Ever the romantic, she’s never been afraid to wear a lacy top or don a cute hat inspired by historical fiction. Her sense of fashion has always been unique and finding a dress that reflected her personal sense of style proved to be a struggle. With her bridal magazines in tow, Kanika visited many Atlanta area bridal shops to find a gown that symbolized the love she had for her fiancé. Most stores only had a few dresses for Kanika to try on that were on-trend and on budget. After visiting half a dozen stores across Georgia and Florida, Kanika's frustration got the best of her. She compromised and settled for a dress she didn’t want because of the limited options available to her and the pressure of not being a size 6 bride. In the end, Kanika found someone who was able to create a gown with the romantic touches she was looking for and it turned out #BeaUtifully. On their honeymoon Kanika's late husband, James, encouraged her to help other brides in their bridal gown search. Being very much in love and focused on starting a family, Kanika put the idea on the back burner. Life took some unexpected turns, but her love for bridal fashion never wavered. After being laid off from her job as a professional writer for an international nonprofit, Kanika made the leap into the realm of small business ownership. With a belief in providing all brides top-notch customer service and a caring touch, Kanika began Curvy Rose. Beyond all the glitter and lace, Kanika’s mission is to inspire brides to see themselves as confident and #BeaUtiful. More importantly, she’s committed to providing a safe place to embrace their bridal journey and find the dress that reflects the #BeaUty of their love. Kanika is a professional writer and communications strategist with over 20 years of experience designing marketing campaigns, spearheading branding efforts and working with C-level executives. She holds a Master of Arts degree in Education from Claremont Graduate University, a Master of Arts degree in Mass Communications from California State University, Fullerton and a Bachelor of Arts degree in English Literature from the University of California, Los Angeles (UCLA). When she's not at Curvy Rose serving brides or partnering with new or existing wedding professionals, Kanika’s primary focus is raising her two precocious daughters, learning calligraphy and advocating for underserved communities. Born and raised in Southern California, Chanza grew up without any expectation of working in the bridal industry. Chanza knew she loved fashion, after all, she had come from a long line of seamstresses. However, she always viewed fashion as a hobby and not a gift that she could share with others. As a child, she used to sit at her mother’s side, fascinated by how a few pieces of fabric and thread could be transformed into a fun costume or frilly dress. From clothing changes throughout the day, to finding the perfect outfit to roller skate in, Chanza always had a knack for expressing her creativity through fashion. Before Curvy Rose, Chanza worked in varying industries including executive board management, human rights policy, and employment discrimination law. However, the long hours and time spent never gave her the fulfillment she dreamed of. Fueled by her love of all things couture, she partnered with her sister Kanika’s vision to open a bridal shop focused on inclusion and empowerment. 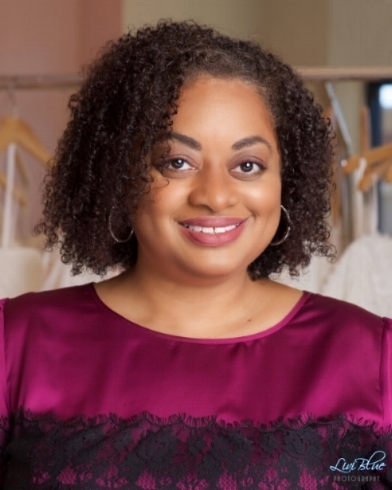 As Curvy Rose's Creative Director, she makes sure that every gown meets the cut, construction, quality and price point that today's brides are searching for. With expert tailoring, high fashion and customer service as her top priority, Chanza is the go-to person for all things on-trend. Chanza holds a bachelor’s degree in Government from Scripps College and attended Northwestern University toward a Master’s Degree in Public Policy and Administration. Combining her varying experiences in the corporate world and her desire to create a better customer experience, Chanza now manages Curvy Rose’s marketing, branding, graphic design, web-design and social media campaigns.